Created in Quito, in present day Ecuador, this statue represents the Archangel Gabriel. The graceful hands, rosy cheeks, and the S-curve pose of this sculpture all reflect Quiteño tastes of the late 18th century. Such features were inspired by Rococo-style engravings and painted ceramic figurines imported from France and other places in Europe. While the accouterments that would have identified this archangel to its original viewers have been lost, including the object he once held in his left hand, he is believed to be Gabriel, the messenger who announced the birth of Jesus to the Virgin Mary. His clothing has also disappeared, but his elaborate silver crown and wings remain, attached to the statue by small nails. Such silver elements were common in the late 18th century and were most likely crafted by silversmiths. By the late 18th century, when this image was created, small religious images had become very popular in Quito. This one was most likely made in a sculptor’s workshop, which would have employed carvers, guilders and painters. Since the 16th century, workshops in Quito had been turning out great numbers of statues for church altarpieces, portable altars, and shrines for the homes of wealthy families. Many of these images, like this one, many were carved of wood, covered in gesso and painted. Silver and clothing would have been attached after the image was painted. In its current museum setting (and in this photograph), the saint appears in a way that would have been foreign to viewers in Spanish America. Originally, he would not have stood alone, but would have been part of a larger ensemble, perhaps accompanied by other archangels. And he certainly would have been clothed: with the exception of the crucified Christ, no saints appeared without garments. The creation of elaborate clothing for church statues like this one was often undertaken by nuns or pious women. In Quito, in the late 18th century, religious sculptures were being made both for local use and for export throughout the viceroyalty. 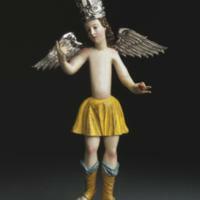 Consequently, angels such as this one were familiar objects in many churches and communities. The spread of Quiteño imagery contributed to both a shared visual style and a shared visual experience of the Christian otherworld. This sense of the otherworld was also brought to life in Spanish America. During certain colonial festivals people dressed as angels and paraded through the streets or performed in religious dramas and plays. 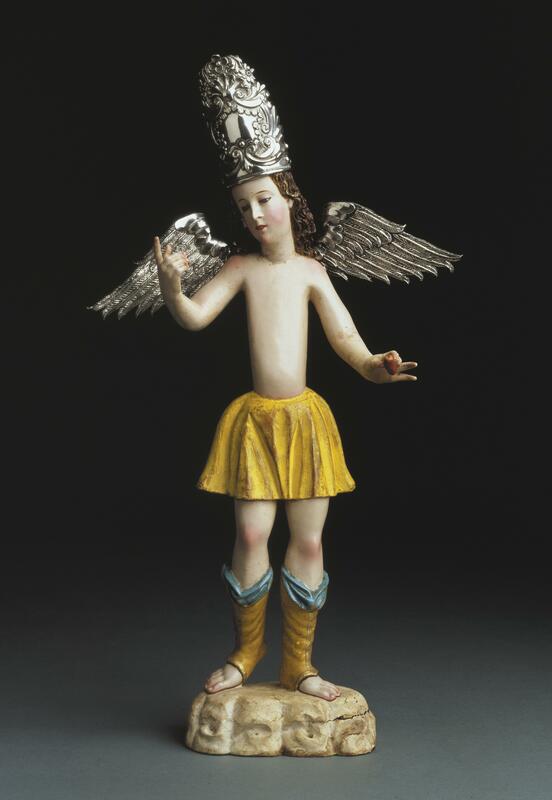 Thus, this sculpture of the Archangel Gabriel was one of many representatives of the otherworlds that Christians created and encountered in colonial cities. Reproduced courtesy of the New Orleans Museum of Art. Museum purchase through the Ella West Freeman Foundation Matching Fund. Escudo-Albornoz, Ximena. 1997. América y España en la escultura colonial quiteña: historia de un sincretismo. Quito: Ediciones del Banco de los Andes. La grâce baroque: chefs-d'oeuvre de l'Ecole de Quito. 1999. Nantes, France: Musée du Château des Ducs de Bretagne. Palmer, Gabrielle G. 1987. Sculpture in the Kingdom of Quito. Albuquerque: University of New Mexico Press. Palmer, Gabrielle G. 1993. La escultura en la Audiencia de Quito. Quito: Municipio de Quito.